While unit 3 was in operation when the earthquake struck on 11 March, and has been in trouble since the tsunami took out emergency diesel generators, unit 4 was fully shut down at that time and had appeared to remain safe until 16 March when an explosion led to fires. 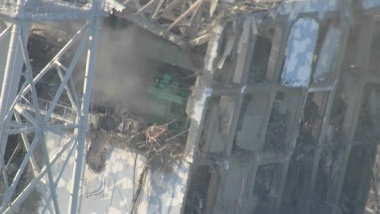 The explosion at unit 4 is thought to have been from a build-up of hydrogen in the area near the used nuclear fuel pond. It severely damaged the building, as well as that of adjacent unit 3, with which it shares a central control room. Neither the IAEA nor the Japan Atomic Industry Forum have data for units 1, 2 and 3. Today the situation of the cooling ponds was the priority of authorities. Containing highly radioactive heat-generating nuclear fuel, they require an adequate level of water to be maintained as well as pumped circulation to control water temperature. In the previous two days the temperature of unit 4's pond had been 84ºC but no more recent data is available. At these temperatures cooling by natural convection begins to be markedly less effective. Normal operating levels are about 25ºC. There was no information on the temperature of the pond at unit 3. However, the high levels of radiation and presence of hydrogen at unit 4 strongly indicate that fuel is uncovered and suffering damage in the pond, although it was not clear that the pond actually emptied. Officials were reassured the pond contained at least some water, based on helicopter observations. Radiation at ground level near units 3 and 4 was high: peaking at 400 millisieverts per hour on the inland side of unit 3, and 100 millisieverts per hour on the inland side of unit 4. At the highest exposure rate, a nuclear worker or soldier could remain in the area for less than 40 minutes before leaving the site, unable to return. With such serious damage to the reactor buildings it is thought that radiation from further degradation of stored fuel at units 3 and 4 would be released to the environment unchecked. Despite high levels of radiation close to the units, levels detected at the edge of the power plant site have been steadily decreasing. With the seriousness of the situation and the radiation levels on the ground, it was decided to try to use a helicopter to douse the reactor building of unit 3. Around 100 metres above the facility radiation was around 87 millisieverts per hour. Two army helicopters made four attempts to drop seawater on unit 3, but this did not appear accurate enough to be effective. Tepco said in a news conference that radiation readings had dropped from 3.78 millisieverts per hour to 3.75 millisieverts per hour, so the effect at present seemed marginal at best. One attempt was made to douse unit 4 but pilots drew back after encountering high levels of radiation. After clearing heavy explosion debris from tsunami and the various explosions across the site over the last six days, eleven high pressure fire trucks showered unit 3. World Nuclear News understands that 30 tonnes of water "was delivered" in an attempt to shoot water through the holes in the side of the building, which appear to be very close to the fuel ponds themselves.